The carbonate-bearing component of a two-part method for dosing calcium and carbonates (the substances largely responsible for increasing alkalinity (”buffering capacity”)) in the same ratio as that found in natural seawater. Ionically-balanced with respect to natural seawater concentrations of calcium and carbonates when used in equal amounts with Reef Cōde A. Basic: Shake product well before using. Add 5 ml (1 capful) of product per 25 US-gallons of aquarium water every other day or as needed to maintain the alkalinity within a range of 7 - 12 dKH. When used in this fashion, 250 ml treats up to 1,250 US-gallons (4,732 L). When used in equal amounts with Reef Code A, the calcium and carbonates being added are in the same ratio found in natural seawater. Do not mix products in the same container; this will cause the active components to precipitate and become ineffective. Allow 60 seconds to pass between dosing with Reef Code A and B. Advanced: Determine the alkalinity in the aquarium using an accurate test kit before supplementing. Shake this product well before each use. Each ml of Brightwell Aquatics Reef Code B will increase the alkalinity in 1 US-gallon (3.785 L) of water by approximately 2.22 dKH (0.79 meq/L). If the initial alkalinity in the aquarium is below 7 dKH (2.5 meq/L), add this product at the maximum rate of 5 ml per 10 US-gallons daily until the desired alkalinity is attained, then dose daily or weekly as needed (see below). Note that each aquarium has different requirements for calcium and carbonates (which largely constitute Alkalinity or Buffering Capacity, hence pH-stability); therefore, it is not uncommon for unequal amounts of Reef Code A and B to be required for obtaining and maintaining the desired calcium concentration and alkalinity. To determine the daily dosing rate for alkalinity maintenance: estimate the volume of water in the entire aquarium system; divide the daily decrease in alkalinity by 2.22 (when measuring alkalinity by dKH; divide by 0.79 when measuring by meq/L); multiply this number by the volume of water in the system to get the daily dosage required (ml) to maintain a stable alkalinity. Contains carbonate and bicarbonate salts; harmful if swallowed. If swallowed: give water, get medical attention. May cause eye or skin irritation. If in eyes, flush with water for 15 minutes, get medical attention. If on skin, wash thoroughly with water. Keep out of reach of children. Not for human consumption. This method of calcium and carbonate supplementation is advantageous to hobbyists interested in a simple and effective solution to providing the very elements and molecules required for growth of reef-building organisms such as corals, clams, and their allies. Corals and other reef-building organisms require adequate and stable available calcium and alkalinity if they are to thrive, regardless of how perfect the remainder of their environment is. Under most conditions, the mineral that is secreted as skeletal material is known as Aragonite, composed mostly of carbonate and calcium by weight. Reef-building organisms must extract these substances from the surrounding water in order to secrete new skeletal material for growth. By maintaining the same ratio of calcium ions and carbonates in an aquarium as that found in natural seawater, these organisms have the necessary building blocks available in the proper proportions, even if the hobbyist chooses to maintain higher concentrations of these substances. 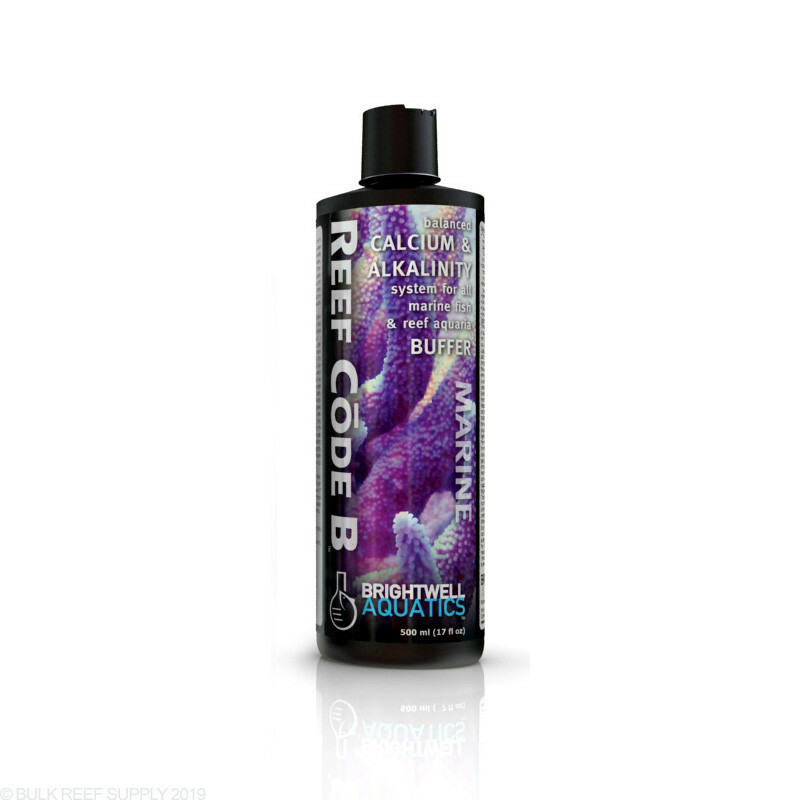 For maximum effectiveness of the Reef Cōde method, the magnesium concentration in reef aquaria should be adjusted to, and maintained between, 1,290 - 1,320 ppm before using these products (alone or together) or any other calcium and alkalinity products. Doing so helps prevent unwanted precipitation between calcium and carbonate ions. Additional information on this subject is available on our website and on the label for Brightwell Aquatics Magnesion. The rate at which calcium and carbonates are extracted from the water is determined by the stocking density of reef-building livestock, type of lighting, and other conditions; therefore, each aquarium will have different requirements for the rate of supplementation. Once the rate of alkalinity depletion in the aquarium has been determined, the proper dosing rate of this product can be easily calculated.